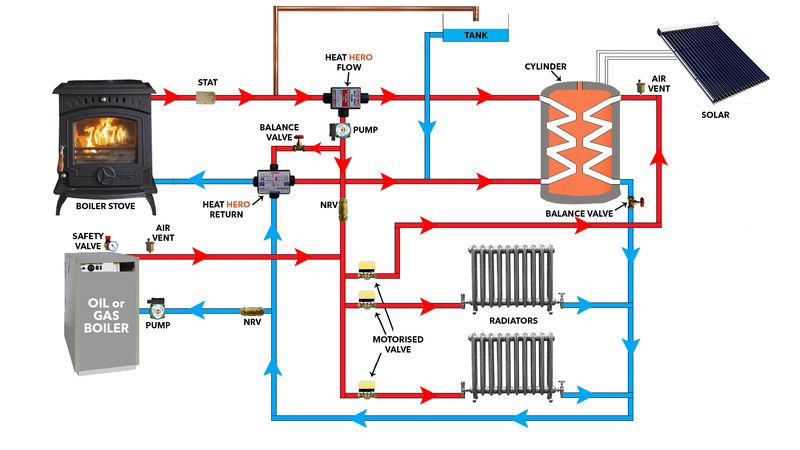 The solid fuel heating system is typically used with a gravity feed circuit to the hot water cylinder, with a vent or overflow to prevent excess pressure build up in the solid fuel heating system. Heat Hero is fully safe and does not stop or restrict the gravity feed circuit. There are no moving parts or electrical components in the Heat Hero manifolds so no maintenance is ever needed. Heat Hero Gravity is the only safe, open vented, gravity, fully pumped, pressurised solid fuel heating system on the market. 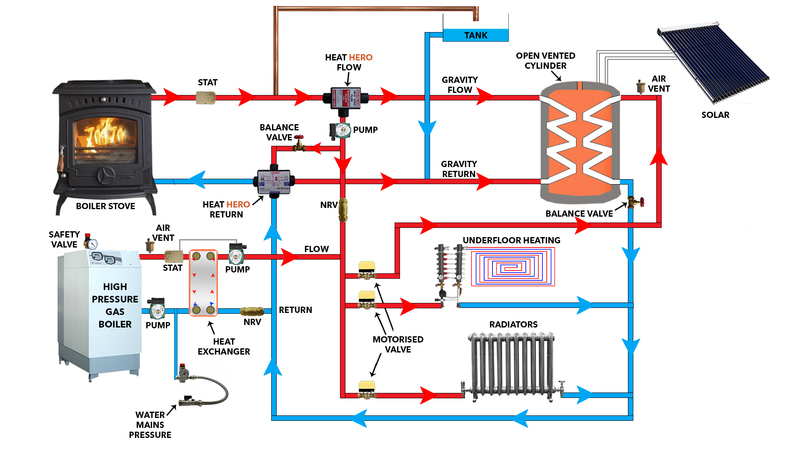 Heat Hero Gravity also improves Oil/Gas Boiler efficiency in a dual heating system. When linking up a Solid Fuel Boiler with an Oil or Gas system it is very important to have pressure. Heat Hero is the only heating system that can create approximately 0.7 bar of pressure throughout the whole heating system. Heat Hero creates strong circulation which heats the water in your solid fuel boiler more often and gives a much better transfer of heat to the radiators, hot water, room heat and you won’t burn as much fuel. Heat Hero can improve the efficiency of your whole heating system by up to 30%. Heat Hero is an award winning Solid Fuel Heating System and was commended ‘Best Innovative Product’ by SEAI at The Energy Show 2016. Major Stove Manufacturers recommend Heat Hero now because it makes solid fuel heating systems more efficient which means your Stove, Cooker or Back-boilers can perform to its maximum efficiency. 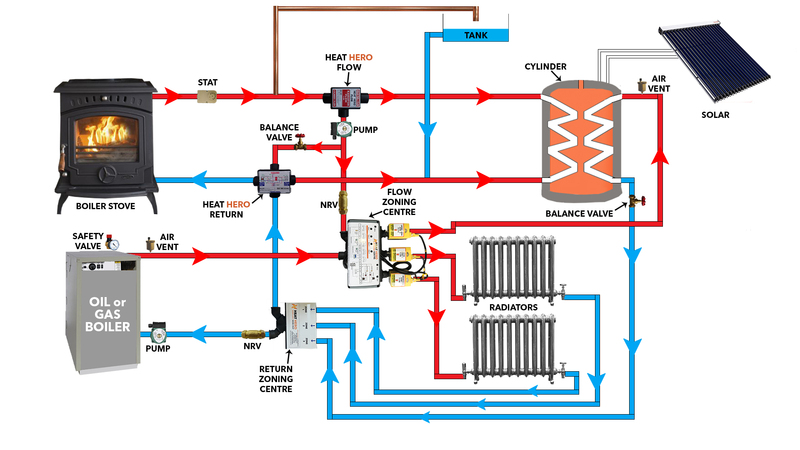 Using Heat Hero Gravity a solid fuel boiler can be connected efficiently to a high pressure gas boiler by installing a heat exchanger on the gas boiler. This will allow the solid fuel boiler witch is a non-controllable heat source to circulate the water directly from the stove to the radiators or under floor heating. This is the most efficient way to connect a solid fuel boiler to a high pressure gas boiler.